The package rinterface is provided as a lower-level interface, for situations where either the use-cases addressed by robjects are not covered, or for the cases where the layer in robjects has an excessive cost in terms of performance. One has to initialize R before much can be done. The function initr() lets one initialize the embedded R.
This is done with the function initr(). The optional argument r_preservehash is using an hash of the memory address as a key in an R environment to preserve R objects from garbage collection. Initialization should only be performed once. To avoid unpredictable results when using the embedded R, subsequent calls to initr() will not have any effect. The functions get_initoptions() and set_initoptions() can be used to modify the options. Default parameters for the initialization are otherwise in the module variable initoptions . Currently the set of default initialization option contains –vanilla , which implies that R_LIBS, whenever set, is ignored. The initialization options will have to be set _before_ the R is started. This can be achieved very simply by added the following lines before initializing the embedded R, or importing rpy2.robjects as this action performs an initialization. If calling initr() returns an error stating that R_HOME is not defined, you should either have the R executable in your path (PATH on unix-alikes, or Path on Microsoft Windows) or have the environment variable R_HOME defined. Should the initialization fail, a mismatch between the version of the R rpy2 was compiled against and the R rpy2 is run with should be investigated. The variable rpy2.rinterface.R_BUILD_VERSION contains information about the R version rpy2 was built against. rpy2 is relatively independent of R versions, but changes in the R C API might cause problems. Ending the R process is possible, but starting it again with initr() does appear to lead to an R process that is hardly usable. For that reason, the use of endr() should be considered carefully, if at all. Terminate an embedded R by calling the function Rf_endEmbeddedR(int fatal) in the R’s C-API. 0 (zero) seems to be be a commonly used integer when calling Rf_endEmbeddedR. Note that a terminated R cannot be restarted from the same process. When writing a GUI for R, a developper may want to either prevent a user to call R quit() , or ensure that specific code is executed before terminating R (for example a confirmation dialog window “do you really want to terminate ?”). This can be done by replacing the callback cleanup with an appropriate function (see Clean up). When using the RPy2 package, two realms are co-existing: R and Python. The Sexp_Type objects can be considered as Python envelopes pointing to data stored and administered in the R space. R variables are existing within an embedded R workspace, and can be accessed from Python through their python object representations. We distinguish two kind of R objects: named objects and anonymous objects. Named objects have an associated symbol in the R workspace. For example, the following R code is creating two objects, named x and hyp respectively, in the global environment . Those two objects could be accessed from Python using their names. The global environment can be seen as the root (or topmost) environment, and is in fact a list, that is a sequence, of environments. When an R library (package in R’s terminology) is loaded, is it added to the existing sequence of environments. Unless specified, it is inserted in second position. The first position being always attributed to the global environment. The library is said to be attached to the current search path. The base package has a namespace, that can be accessed as an environment. Depending on what is in globalenv and on the attached packages, base objects can be masked when starting the search from globalenv . Use baseenv when you want to be sure to access a function you know to be in the base namespace. Anonymous R objects do not have an associated symbol, yet are protected from garbage collection. Such objects can be created when using the constructor for an Sexp* class. creates a fully usable R vector, but it does not have an associtated R symbol (it is in memory, but cannot be called by name fomr R). It is also protected from garbage collection until, until x is deleted and the Python garbage collector destroys x . To finalize the recovery of the memory used, the R garbage collector must be also be called. This should happen automatically while running R code when a threshold of memory usage is reached, but it is also possible to call explicitly both garbage collectors. See Memory management and garbage collection for more details. The root of the R language is functional, with arguments passed by value. R is actually using tricks to lower memory usage, such as only copying an object when needed (that is when the object is modified in a local block), but copies of objects are nevertheless frequent. This can remain unnoticed by a user until large objects are in use or a large number of modification of objects are performed, in which case performance issues may appear. An infamous example is when the column names for a matrix are changed, bringing a system to its knees when the matrix is very large, as the whole matrix ends up being copied. On the contrary, Python is using pointer objects passed around through function calls, and since rpy2, is a Python-to-R interface the Python approach was conserved. And rename the third column (remembering that R vectors are 1-indexed while Python sequences are 0-indexed). Unlike with the R code, neither the matrix or the vector with the column names are copied. Whenever this is not a good thing, R objects can be copied the way Python objects are usually copied (using copy.deepcopy(), Sexp implements Sexp.__deepcopy__()). The resulting expression is a nested list of R statements. The R code 1 + 2 translates to an expression of length 3: +(1, 2), that is a call to the function + (or rather the symbol associated with the function) with the arguments 1 and 2. The expression must be evaluated if the result from its execution is wanted. Parse a string as R code. As could be expected from R’s functional roots, functions are first-class objects. This means that the use of callback functions as passed as parameters is not seldom, and this also means that the Python programmer has to either be able write R code for functions as arguments, or have a way to pass Python functions to R as genuine R functions. That last option is becoming possible, in other words one can write a Python function and expose it to R in such a way that the embedded R engine can use as a regular R function. As an example, let’s consider the R function optim() that looks for optimal parameters for a given cost function. The cost function should be passed in the call to optim() as it will be repeatedly called as the parameter space is explored, and only Python coding skills are necessary as the code below demonstrates it. For convenience, the code example uses the higher-level interface robjects whenever possible. The lower-level function rternalize() will take an arbitray Python function and return an rinterface.SexpClosure instance, that is a object that can be used by R as a function. Takes an arbitrary Python function and wrap it in such a way that it can be called from the R side. The embedded R started from rpy2 is interactive by default, which means that a number of interactive features present when working in an interactive R console will be available for use. Such features can be called explicitly by the rpy2 user, but can also be triggered indirectly, as some on the R functions will behave differently when run interactively compared to when run in the so-called BATCH mode. However, interactive use may mean the ability to periodically check and process events. This is for example the case with interactive graphics devices or with the HTML-based help system (see Processing interactive events). An interactive R session is can start interactive activities that require a continuous monitoring for events. A typical example is the interactive graphical devices ( plotting windows ), as they can be resized and the information they display is refreshed. However, to do so the R process must be instructed to process pending interactive events. This is done by the R console for example, but rpy2 is designed as a library rather than a threaded R process running within Python (yet this can be done as shown below). The way to restore interactivity is to simply call the function rinterface.process_revents() at regular intervals. An higher-level interface is available, running the processing of R events in a thread (see Section R event loop). The class Sexp is the base class for all R objects. R does not count references for its object. This method returns the NAMED value (an integer). See the R-extensions manual for further details. Make a deep copy of the object, calling the R-API C function c:function:: Rf_duplicate() for copying the R object wrapped. R objects can be given attributes. In R, the function attr lets one access an object’s attribute; it is called do_slot() in the C interface to R.
Assign value to the slot with the given name, creating the slot whenver not already existing. Tell whether the underlying R object for sexp_obj is the same or not. The underlying R object is a pointer to a c:type:: SEXPREC as defined in R’s Rinternals.h . That object is wrapped in a c:type:: SexpObj and placed in a Python capsule. The capsule is providing a relatively safe mechanism to exchange underlying R objects between rpy2 objects. In R all scalars are in fact vectors. Anything like a one-value variable is a vector of length 1. R vectors all have a type , sometimes referred to in R as a mode . This information is encoded as an integer by R, but it can sometimes be better for human reader to be able to provide a string. Return a string corresponding to a integer-encoded R type. The indexing is working like it would on regular Python tuples or lists. The indexing starts at 0 (zero), which differs from R, where indexing start at 1 (one). The __getitem__ operator [ is returning a Python scalar. Casting an SexpVector into a list is only a matter of either iterating through it, or simply calling the constructor list(). Elements in a name vector do not have to be unique. A Python counterpart is provided as rpy2.rlike.container.TaggedList. In the case of an array , the names across the respective dimensions of the object are accessible through the slot named dimnames . R also has the notion of missing parameters in function calls. This is a separate concept, and more information about are given in Section Functions. In R missing the symbol NA represents a missing value. The general rule that R scalars are in fact vectors applies here again, and the following R code is creating a vector of length 1. The type of NA is logical (boolean), and one can specify a different type with the symbols NA_character_, NA_integer_, NA_real_, and NA_complex_. In rpy2.rinterface, the symbols can be accessed by through NA_Character, NA_Integer, NA_Real. 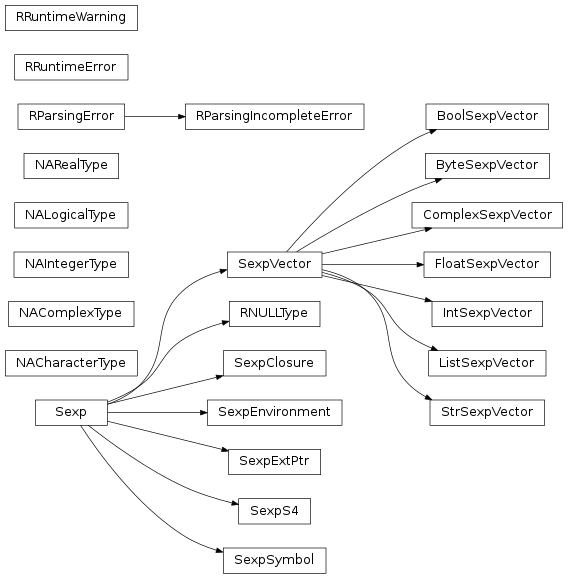 Those are singleton instance from respective NA<something>Type classes. NA values can be present in vectors returned by R functions. NA values can have operators implemented, but the results will then be missing values. Python functions relying on C-level implementations might not be following the same rule for NAs. This should be preferred way to use R’s NA as those symbol are little peculiar and cannot be retrieved with SexpEnvironment.get(). Those missing values can also be used with the rpy2.robjects layer and more documentation about their usage can be found there (see Missing values). Missing value for an integer in R.
Missing value for a float in R.
Missing value for a boolean in R.
Missing value for a string. Missing value for a complex in R.
R object that is a vector. R vectors start their indexing at one, while Python lists or arrays start indexing at zero. In the hope to avoid confusion, the indexing in Python (e.g., __getitem__() / __setitem__()) starts at zero. The [ operator will only look for a symbol in the environment without looking further in the path of enclosing environments. The constant pi is defined in R’s base package, and therefore cannot be found in the Global Environment. a copy of the R object is made in the R space. The object is made iter-able. In the current implementation the content of the environment is evaluated only once, when the iterator is created. Adding or removing elements to the environment will not update the iterator (this is a problem, that will be solved in the near future). Whenever a search for a symbol is performed, the whole search path is considered: the environments in the list are inspected in sequence and the value for the first symbol found matching is returned. The constant pi is defined in the package base , that is always in the search path (and in the last position, as it is attached first). The call to get() will look for pi first in globalenv , then in the next environment in the search path and repeat this until an object is found or the sequence of environments to explore is exhausted. Error: could not find function "mydate"
 "Sat Aug  9 15:27:40 2008"
The base function date is still found, although a non-function object is present earlier on the search path. The same behavior can be obtained from rpy2 with the optional parameter wantfun (specify that get() should return an R function). In a Python programmer’s perspective, it would be nice to map loaded R packages as modules and provide access to R objects in packages the same way than Python object in modules are accessed. This is unfortunately not possible in a completely robust way: the dot character . can be used for symbol names in R (like pretty much any character), and this can make an exact correspondance between R and Python names rather difficult. rpy uses transformation functions that translates ‘.’ to ‘_’ and back, but this can lead to complications since ‘_’ can also be used for R symbols (although this is the approach taken for the high-level interface, see Section R packages).
""" import an R package and return its environment """
For example, we can reimplement in Python the R function returning the search path ( search ). As an other example, one can implement simply a function that returns from which environment an object called by get() comes from.
""" when calling 'get', where the R object is coming from. """ Unfortunately this does not generalize to all cases: the base package does not have a name. LookupError: The object has no such attribute. In R terminology, a closure is a function (with its enclosing environment). That enclosing environment can be thought of as a context to the function. Technically, the class SexpClosure corresponds to the R types CLOSXP, BUILTINSXP, and SPECIALSXP, with only the first one (CLOSXP) being a closure. Named arguments to an R function can be specified just the way they would be with any other regular Python function. In the example below, we inspect the environment for the function plot, that is the namespace for the package graphics. In R function calls can contain explicitely missing parameters. This is used when extracting a subset of an array, with a missing parameter interpreted by the extract function [ like all elements across that dimension must be taken. rinterface.MissingArg is a pointer to the singleton rinterface.MissingArgType, allowing to explicitly pass missing parameters to a function call. For example, the extraction of the second column of a matrix with R shown above, will write almost identically in rpy2. Object-Oriented programming in R exists in several flavours, and one of those is called S4 . It has its own type at R’s C-API level, and because of that specificity we defined a class. Beside that, the class does not provide much specific features (see the pydoc for the class below). An instance’s attributes can be accessed through the parent class Sexp method do_slot(). R object that is an ‘S4 object’.Attributes can be accessed using the method ‘do_slot’. External pointers are intended to facilitate the handling of C or C++ data structures from R. In few words they are pointers to structures external to R. They have been used to implement vectors and arrays in shared memory, or storage-based vectors and arrays. External pointers also do not obey the pass-by-value rule and can represent a way to implement pointers in R.
The Python string is now encapsulated into an R external pointer, and visible as such by the embedded R process. However, this remains a rather academic exercise unless there exists a way to access the data from R; when used in R packages, external pointers have companion functions to manipulate the C-level data structures. In the case of external pointers and their companion functions and methods defined by R packages, the rpy2 interface lets a programmer create such external pointers directly from Python, using ctypes for example. However, the rpy2 interface allows more than that since a programmer is able to make a Python function accessible to R has is was a function of its own. It is possible to define arbitrary Python data structures as well as functions or methods to operate on them, pass the data structure to R as an external pointer, and expose the functions and methods to R.
Function with an enclosure. Represented by rpy2.rinterface.SexpClosure. Instance of class S4. Represented by rpy2.rinterface.SexpS4.